The free GODAN e-learning course on Open Data and Research Data Management in Agriculture and Nutrition - started on 13 November 2017 - is in its second week. The course is enriched by a number of Webinars designed to strengthen the course content, give course participants broader perspective in the relevant Open Data areas. 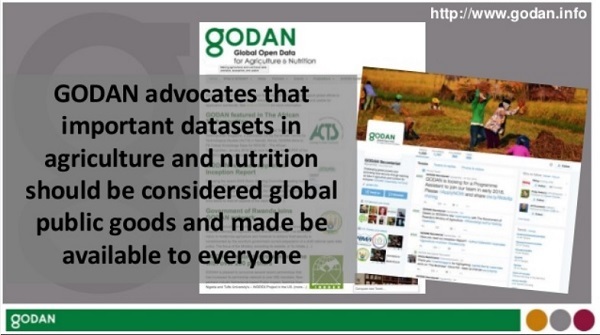 The first course Webinar introduced the Global Open Data for Agriculture (GODAN) initiative. allowed participants to create interactive environments with their questions and discussions. The session visited some definitions of Data on the data spectrum, also through examining the work of the network’s facilitation mechanism (the GODAN Secretariat), and its research and capacity building and research unit (GODAN Action: #GODANAction) in communicating the value of open data in the sector. Martin Parr has over fifteen years’ experience of working on web-based products, mobile internet and research communication services. He now manages a number of CABI’s Knowledge projects for International Development and is Head of Open Data at CABI and Operations Manager for the GODAN Secretariat. He specializes in programme management, business development, key account management, research communication and knowledge management, monitoring and evaluation, mobile services, and open data policy and practice.